She's sure to be delighted when she receives this enchanting bouquet. Reminiscent of a sunny day, this bouquet consists of bright yellow Gerbera daisies and soft peach roses artfully arranged against a backdrop of assorted blue and white wild flowers and verdant greens. 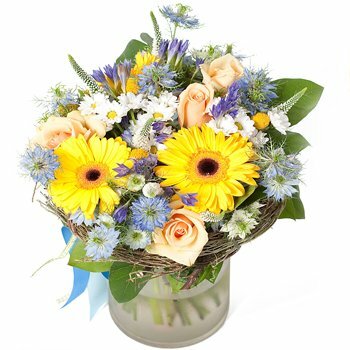 For moms on Mother's Day, for spouses on birthdays, or for treasured friends to say I care, order the Sunny Skies Bouquet.